Happy camper: Seth Haber of Trek Light Gear offers products with purpose. Hot, stuffy and uncomfortable wasn't exactly how Seth Haber wanted to feel during his camping excursions. 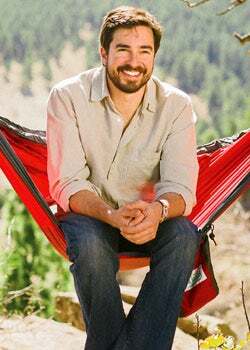 But the weekend outdoorsman, who in 2001 moved from Rhode Island to Boulder to take advantage of Colorado's abundant recreation opportunities, found the traditional setup of a tent and sleeping pad uncomfortable. He decided to create a better way for weary trekkers to get some rest. After a year of experimenting with various fabrics and designs, Haber launched Trek Light Gear, a line of hammocks. Made from the durable nylon used for parachutes, the hammocks provide comfort for not only campers but the environment; unlike tents, they don't crush plants or leave worn spots on the ground. Though lightweight, the material is very strong--Haber says a typical Trek Light hammock can support up to 400 pounds. Once the design was set, Haber spent weekends hawking his wares at festivals and consumer shows. By 2005, with sales heating up, he tanked his desk job at a medical company. Haber won't disclose sales figures but confirms the company is growing. He has hired a full-time staffer, and in February moved Trek Light's headquarters out of his living room and into a commercial space. As he immersed himself in Trek Light, Haber sought ways to incorporate more sustainable practices. Inspired by the "buy one, give one" movement, he decided to work with environmental nonprofits to plant a tree for each hammock sold. And, troubled by the waste from his company's manufacturing process, he created Eco Totes, a line of reusable bags made from leftover hammock fabric. 14 percent of Americans (ages 7and older) went camping in 2010. 40 percent of camping participants have an annual household income of at least $75,000. Despite the economic downturn, 61 percent of campers say they spent as much on sports and recreation in 2010 as they did in 2009. Haber continues to launch additional product lines, with accompanying charitable components generated from sales. Later this year, Trek Light will offer tarp accessories to benefit clean water organizations; mosquito nets to support malaria organizations; and a lightweight backpack to raise funds for education charities. Sales of a recently introduced special-edition yellow hammock support cancer research. Haber says his company has planted "thousands of trees" already, and he expects that number to grow significantly if the wholesale agreements he has in the works come to fruition. Haber sees the tie-ins he has implemented as essential to the company's existence. "That, to me, is what all business should be about: finding success personally and creating good for others around you," he says.